Work-At-Home Success is mostly focused on helping people create a career from home; however, many people looking to make money at home don’t necessarily need to earn a living. Many visitors are looking to earn extra income to pay off debt or mad money to support hobbies and other fun. Or they need something that pays relatively quickly. 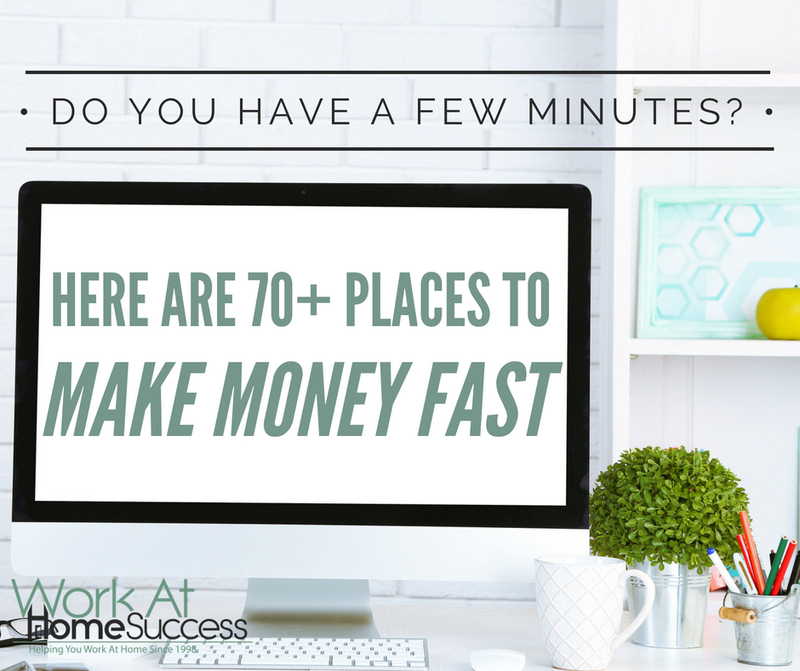 The 70+ resources below offer quick and easy ways to make a few bucks. They’re not designed to help you pay your rent or earn a salary. Instead, they offer ways to earn a few extra dollars or credits you can use to buy stuff. Some will help you save money. A few pay or give you credits for doing things you already do, such as watching TV or grocery shopping. There are several ways to make money with your car including renting it out or driving other people around. From surveys to short tasks to money savings, you can earn money and gift cards through your smartphone. Do you have few minutes to research, proof read, or other small tasks? You can get paid doing short, quick tasks. Do you enjoy shopping? Help stores get the feedback they need about their shoppers’ experience through mystery shopping. Do you have a ton of photos sitting on your phone or digital camera? You can sell them as stock photos. Do you have a cool talent such as singing, drawing, making clipart, editing video, or something else? These sites let you sell your talent. Get paid to share your opinion about businesses and products, and earn cash or gift cards in the process. Do you have other resources for making money in a few minutes?